The story of Two Battlefield Crosses: Lieutenant Colonel Bernard Hedley Charlton and Captain Richard Godolphin Hume Chaloner, Saint Nicholas Church, Guisborough. 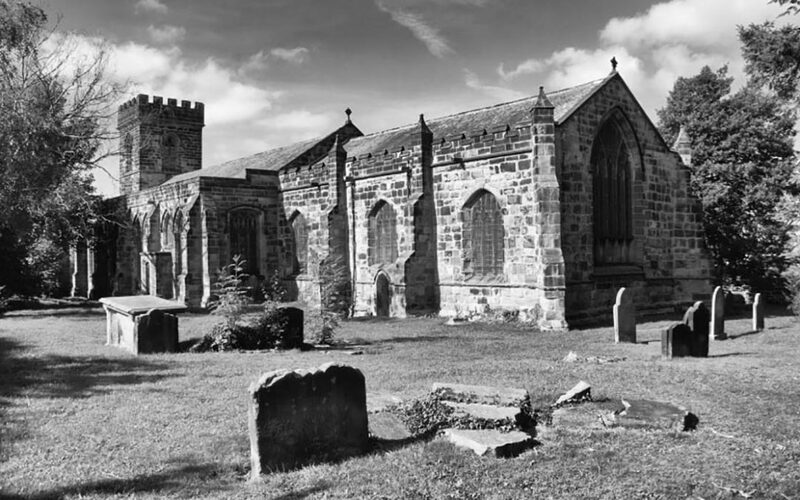 There are two crosses in the parish church of Guisborough, North Yorkshire, and each of them displays a profound connection with the town, its industry and its estates. Chaloner appears on the war memorial outside the church and is listed incorrectly as serving with the Kings Royal Rifle Corps when in fact he was serving at the time of his death with the 3rd Battalion of the Wiltshire Regiment. He was killed on 3rd April 1917 by friendly fire from one of his own sentries during a storm at night. He is buried in the Officers Row of Calais Southern Cemetery (Beaumaris), Calais (Plot A. Row Officers. Grave 15). Chaloner was the eldest son and heir and had previously served with the 16th Lancers in South Africa. At the time of his death he was attached to Number 20 Prisoner of War Company based in Calais. Having approached his own sentries and made no gesture when challenged they opened fire. This may have been because of the sound of a thunderstorm. The Chaloners had long been in receipt of the Gisborough Estate and had built their wealth upon Alum mining. Much of the estate land locally was Chaloner land and was leased out to a variety of mining companies. The mining was largely ironstone by this time. The family still partly occupies Gisborough Hall and still owns significant sections of the moorland. It is said that his childhood nanny had a premonition of his death which was made aware to the family. Bernard Hedley Charlton was born in 1885 to William and Elizabeth Charlton of West Garth House, Westgate, Guisborough. He died during the battle of St. Quentin on 22nd March 1918 whilst rallying his troops and is buried at I.I.16, Roisel Communal Cemetery Extension, Somme, France. Charlton is unusual in that there are two Battlefield Crosses for him. The one in Saint Nicholas is a replacement for the original which suffered a broken shaft and is now in place at the Green Howards museum Richmond and was previously at Philip and James Church, Tow Law where Charlton was the mine manager and agent at East Hedley and Hedleyhope mines. Charlton attended Guisborough Grammar school next door to Saint Nicholas and was a keen sportsman and prior to the war a member of the territorials He was gassed at the 2nd Battle of Ypres and spent 5 months recuperating. He was awarded the Military Cross in January 1916 for exemplary gallantry. He was Mentioned in Despatches twice and was promoted to Lieutenant Colonel on 27th December 1917. His Military Cross is on display at the Green Howards Museum. The Newcastle Journal, on 17th November 1915 records his wedding at Hurworth to Miss Frances Jollife conducted by the Rev. Canon Holmes, chaplain to the 4th Yorkshire Regiment, and the Rev. Arthur Faber, Rector of Hurworth. Captain Fred. Knott, 4th Yorkshire Regiment, acted as best man. They had one daughter, Diana Hope Charlton, who died in Hampshire in June 2005. The couple received an ornamental clock from the workers at Hedleyhope on their marriage which is now in private hands. The Whitby Gazette of 10 September 1909 documents Charlton’s certification of mines manager and he became an agent and manager for Samuelsons and Sons, at East Hedley and Hedleyhope mines, later incorporated into the larger steelmaking conglomerate of Dorman Long. Charlton has a bornze tablet dedicated to him in the offices of The North of England Institute of Mining and Mechanical Engineers. The Charlton family had long been agents and engineers for the local mines – specifically Slapewath Mine and Spa Wood mine where both Bernard and his family worked. The local mine village next to Slapewath pit, Charltons, is named for the family. Although two terraces remain a third had to be demolished in the 1960s due to mining subsidence. Bernard went from these mines to managing his own in Durham after achieving his mine management certificate but these were operated by the same company of Samuelsons. Remnants of Samuelsons iron foundry still exists in Middlesbrough in the form of ‘Sammys’ working men’s club but the rest of the site has been destroyed by development. My own great great grandfather was ‘sweeper-upper’ at Samuelson’s foundry until he retired to be taken into and die in the local workhouse. Bibliographical note: some of this material is from the Durham Mining Archives, the IWM Archives and the publication of local historians Guisborough Remembers the Great War. Thanks to Rev. Alison Phillipson and Saint Nicholas Church for access to the Battlefield Crosses.